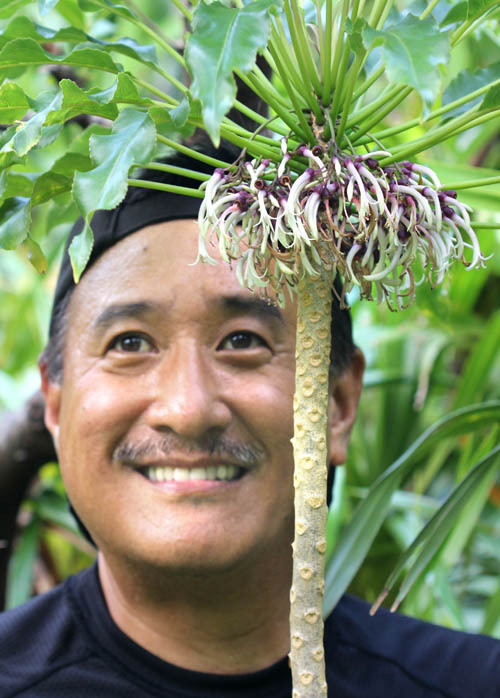 One of my favorite things to do is to hike to remote locations on Oʻahu to see the unusual flowers of Haha or Cyanea when they bloom. 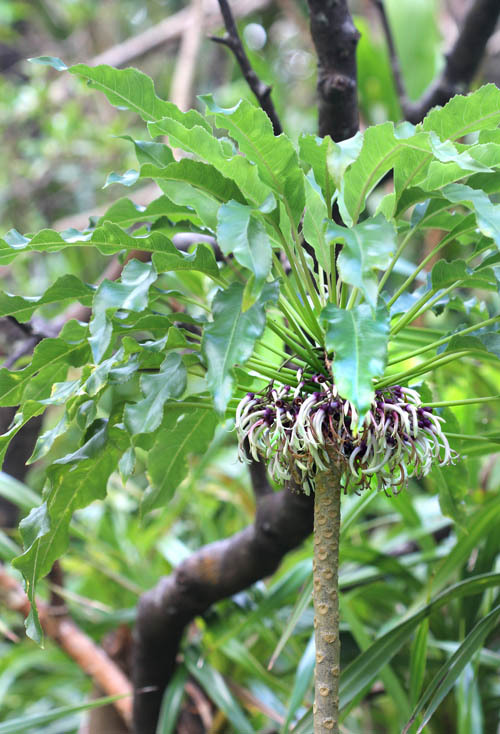 Cyanea are in the lobelioid group of flowering plants endemic to the Hawaiian Islands. The group is in the bellflower family — Campanulaceae — and are believed to have evolved from a single population of plants that found its way to the Hawaiian Islands about 13 million years ago — when Gardner Pinnacles and French Frigate Shoals were high islands long before the current main islands existed. 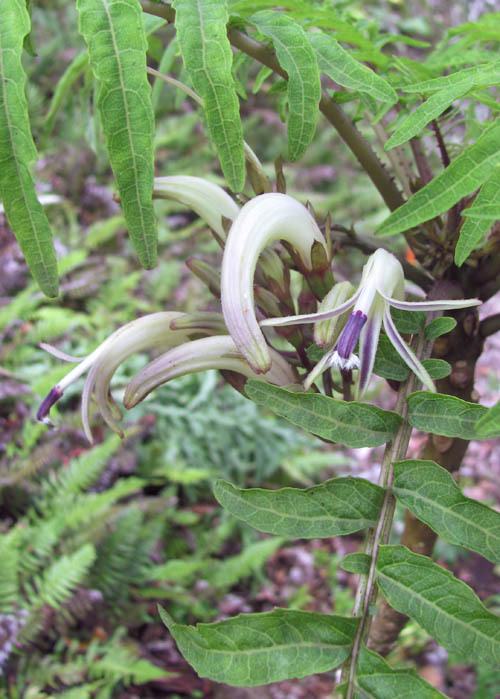 Over the passage of eons, the Hawaiian lobelioid group evolved into over 125 different species — many of which are rare or endangered today — and are classified into six genera: Cyanea, Clermontia, Delissea, Lobelia, Trematolobelia and Brighamia. Cyanea is the largest and most diverse genus with more than 70 species. One of the rarest and most endangered of the cyaneas is Cyanea superba which is extinct in the wild. Had it not been for biologists who collected seeds in the wild, raised them in greenhouses, and planted them within protective fences, the plants would be extinct. 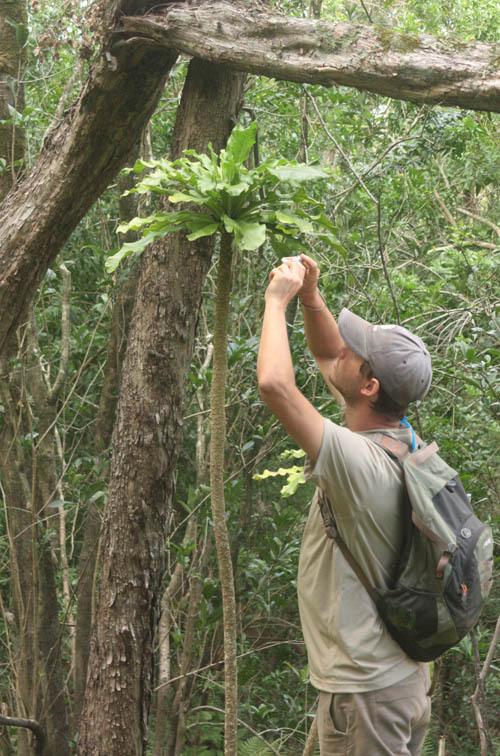 The plants have a single stalk that grows up to 25 feet tall. 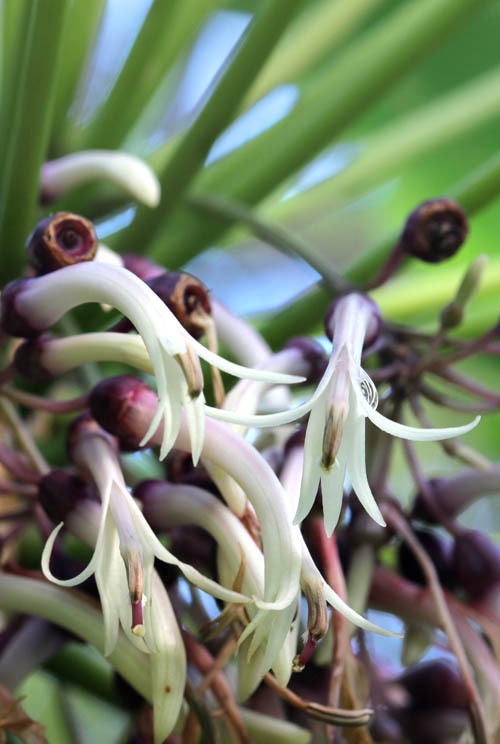 When they bloom, flowers dangle beneath the broad leaves that emanate from the apex of the semi-woody stalk. The white flowers are about 3 inches long with a curved tubular shape. 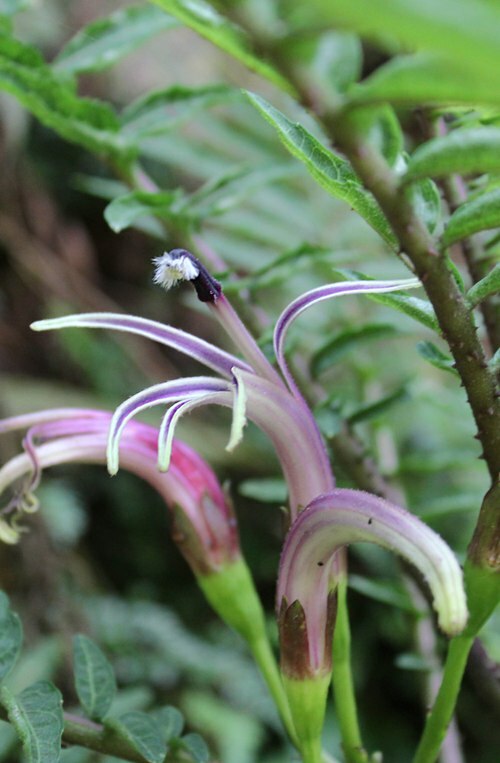 The flowers co-evolved with native forest birds whose curved beaks match the curve of the flowers. When the birds insert their beaks to sip nectar at the base of the tube, their heads touch the stamenal brushes of the flower which deposit pollen on their heads and are taken to pollenate the next flower. Another extremely rare and endangered cyanea is Cyanea truncata, which has been reduced to a single population in the wild. 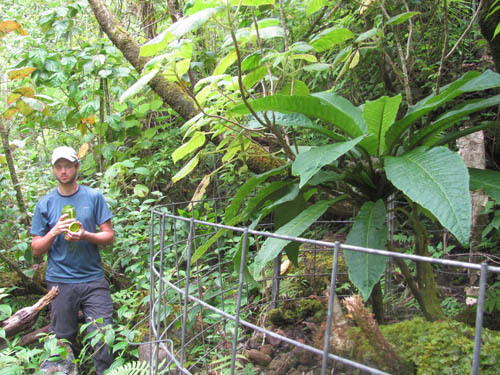 Biologists have constructed a fenced exclosure around the plants to prevent pigs and other ungulates from eating and digging them up. 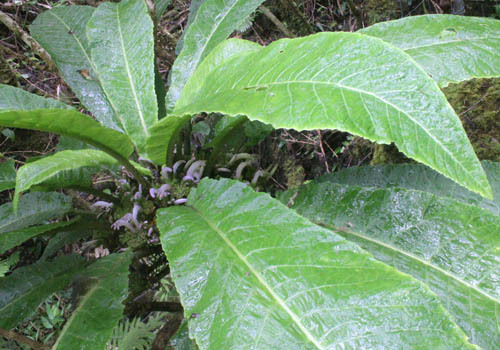 Cyanea truncata have large broad leaves up to 2 feet long and 8 inches wide. Flowers grow upwards and are hidden with the shock of leaves. 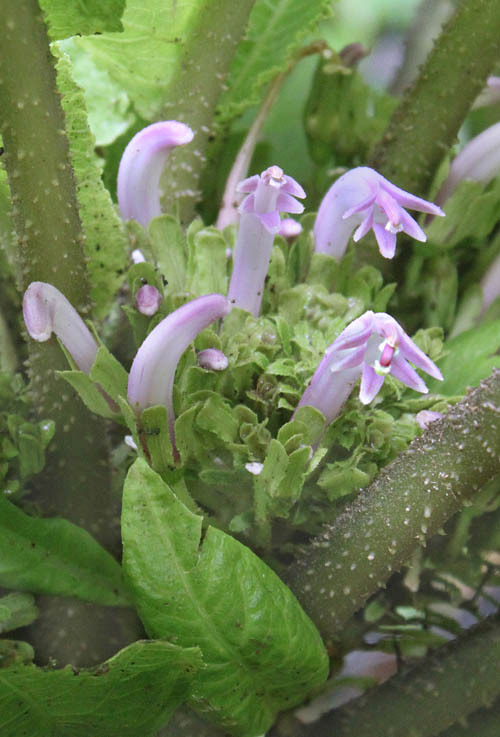 The curved tubular flowers are a little over and inch long and are a pale purple-pink color. Another rare and endangered cyanea is Cyanea grimseana whose leaves have divided into leaflets that alternate on either side of the leaf stem. Cyanea grimseana is unusual in that it has thorns — evolving in a completely different direction from many other plants who lost their thorns when they found their way to the Hawaiian Islands. There is considerable variation in the color of Cyanea grimseana flowers — some are more white than others — but most have purple petals that are outlined in white. One of the more numerous cyaneas is Cyanea angustifloia which unlike the other cyaneas is not on the list of endangered species but is by no means common. The cool thing about Cyanea angustifloia is that it often has dozens of flowers at the same time which dangle beneath the leaves at the top. 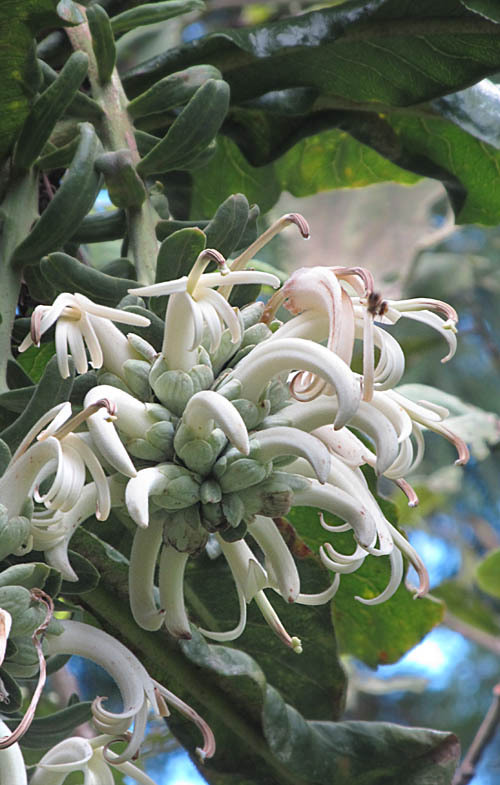 The flowers of Cyanea angustifloia are small — under an inch long and are almost entirely white with a purple calyx at the base. The plants generally bloom in late summer although I have seen them bloom out of season. Haha are such rare and unusual flowers that I can spend hours looking for and at them. With over 70 different species found no where else in the world I have much to look forward to in the years to come. Haha blooming is a strong reason to consider moving back to Hawaii. Thanks for the lesson Nate. 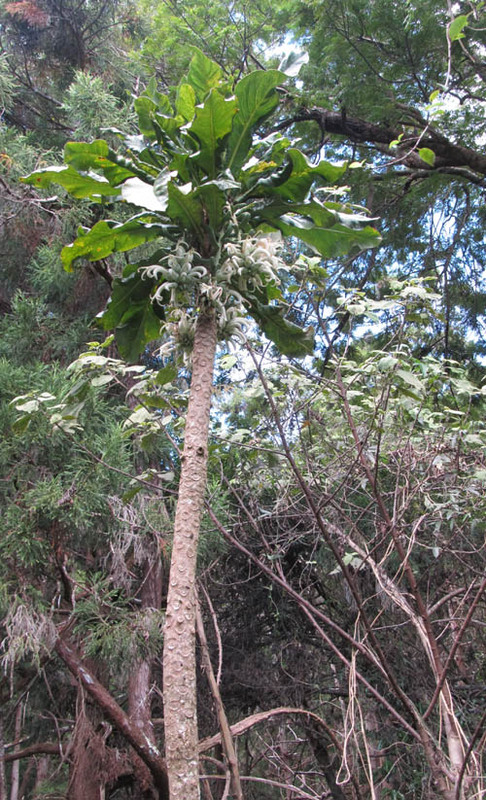 I think we may have spotted one species of this plant on the Wai’anae Kai hike Sunday, along the ridge to three poles. I’ll post it to your facebook page. Thank you so much for your priceless contribution to Native Plant appreciation and protections. Breathtaking pictures and sublime dreams for armchair travelers.